Doesn't this figure? Just as I was bellyaching that Fall had come no where near North Carolina yet, the weather has shifted, we've finally gotten a fair amount of rain after having none for several weeks and the temperatures are supposed to be below 80 degrees all week - woo! 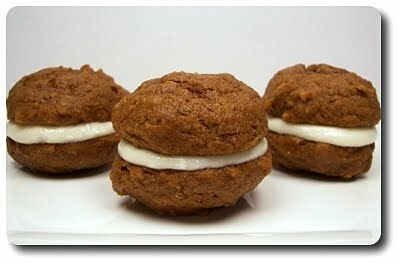 With that in mind, and seeing the farmers' markets and road-side stands flooded with several varieties of pumpkins, we thought it was time to finally give these Mini Pumpkin Whoopie Pies with Cream Cheese Filling a try! These hand-held pies are wickedly spicy, but not in the sense of hotness - in fact, you may even think twice about the amounts listed, but don't be swayed to reduce them. You want that aromatic and definitive punch from the cinnamon, ginger and allspice as they light up when paired with the generous amount of mashed pumpkin inside each soft, cake-like cookie. If they were served warm or hot, the spice may come across a little overwhelming, but since the cookie sandwiches are chilled, their essence is somewhat dulled, hence the bulky amount. Whether you use homemade mashed pumpkin (drained to a thicker consistency similar to what you would find in a can) or reach for the more convenient can in the market (and yes, you can rejoice - the shortage from the last couple of years is over! ), make sure it is thoroughly chilled before you add it into this recipe. Having this cold helps the dough stay a bit tight, allowing the cookies to set and puff, rather than spread and flatten in the hot oven. 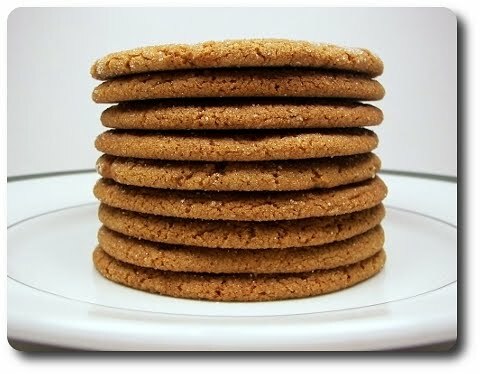 Rich with dark brown sugar, once you scoop the batter onto the pans and slip them into the oven to bake, the cookies are ready to be pulled out when you can press on their tops and the indent springs back, or if you place a toothpick into the center, it should come back out mostly clean with a moist crumb or two attached. Instead of immediately transferring them to a wire rack, allow them to cool on the pans before moving them. 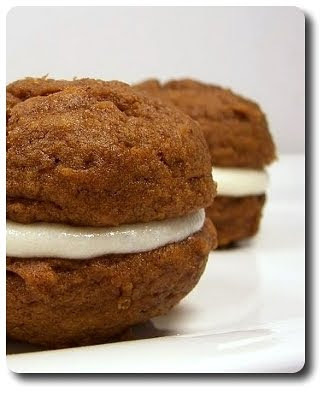 If you are a traditionalist when it comes to whoopie pies, then you know the filling I'm about to talk about is not very traditional. There would be shortening involved, and it could either be combined with a cooked flour concoction or marshmallow fluff, depending on where you pick up your pies in the country. Both versions work fine and shortening does have its use (especially in cookies and pie crust! 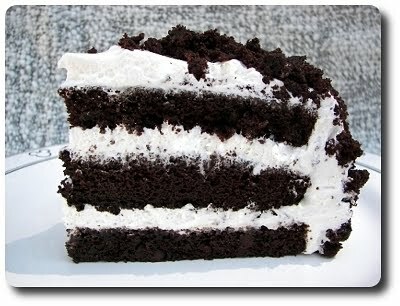 ), but I'm not a giant fan of its mouth-feel in frosting. 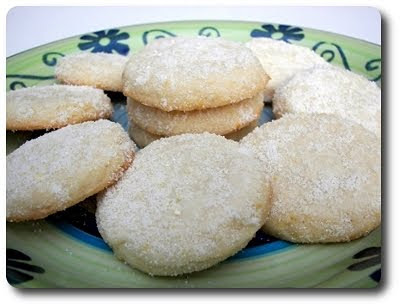 For these, we stuck with the suggested filling of softened butter, cream cheese, vanilla and confectioners' sugar. 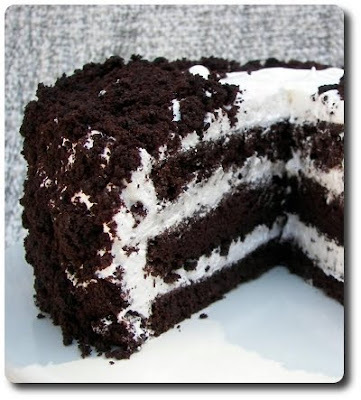 Be sure to beat the butter smooth before adding the cream cheese and sift the confectioners' sugar for an velvet-y smooth center. 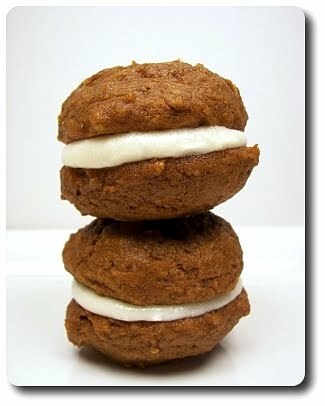 The original recipe was listed to have a yield of twelve (which was either an error or they intended to make some mammoth whoopie pies! ), but we went somewhat miniature in size and ended up with 28 cute three or four bite treats. Notably moist, soft and definitely pumpkin-y, we found there to be just enough of the decadent filling smashed in between the two cookies (though some may label them as small cakes) that you had plenty with each bite, plus a little extra that squishes out - just so you have an excuse to lick the extra filling off your fingers! I do think adding a little maple, preferably in the form of a robust grade B to get the most bang for your buck, to the creamy filling would be a nice touch and compliment the pumpkin shells. Always full of surprises, Jeff asked the other day if we could have burgers one night for dinner this week. 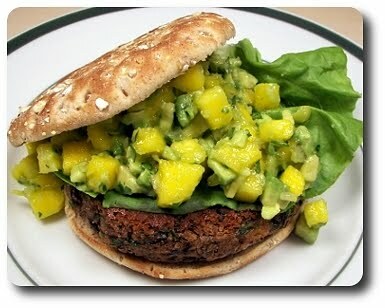 That really wasn't a big surprise, but what followed is what took me aback - he asked for a veggie burger! That's a new request! 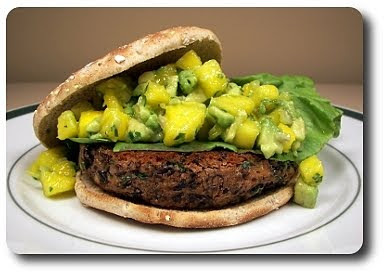 Happy to oblige, I gave him a few options and since he's been crushing on mangos as of late, he ended up snatching the recipe for these Black Bean Burgers with Mango Salsa. Black beans, of course, form the base of these burgers. The beans are smashed chunky-smooth using a potato masher, and ramped up by mixing them with fresh cilantro, Monterey Jack cheese, crisp panko breadcrumbs, cumin, oregano, a touch of ancho chile powder, salt and a finely chopped half to a full serrano pepper. Use a jalapeño if you like and to reduce the bite, take the ribs and seeds out of whichever you use - we, however, used the whole shebang as we both like a little burn. I'd also think about maybe using chipotle peppers in adobo for a more smoky heat. To help bind the burgers together, an egg is tossed into the mix and once formed into patties, we let them chill in the refrigerator to further aid in them holding together. You don't have to chill them if you are rushed for time, but as I've found with past homemade veggie burgers, this does wonders. You can cook these bean-y burgers a couple ways. We decided to drizzle our trusty cast-iron skillet with a bare amount of canola oil and crisp each side, warming the middles through. If you don't want to fuss with that, you could use your oven - heat it to a moderate temperature (350) with a sturdy sheet pan inside. Drizzle the pan with oil (or spray with cooking spray) and carefully place the burgers on and bake, turning them over halfway through, until completely heated through, about 20 minutes. I do think the skillet is the way to go as the outside had a good crust, which set off the creamy inside. For a rejuvenating condiment, these burgers are topped with a brilliant salsa made from chopped mango, bits of shallots, chopped creamy avocado and garlic, which we spiked with fresh lime juice to not only add an acidic note, but to keep the avocado vibrant and green. To serve, we opted to pile the burger, a leaf or two of crisp lettuce and salsa on those flat sandwich thins instead of a bulky burger bun, which may have put us in carb overload - pitas might be a nice, lighter option too. 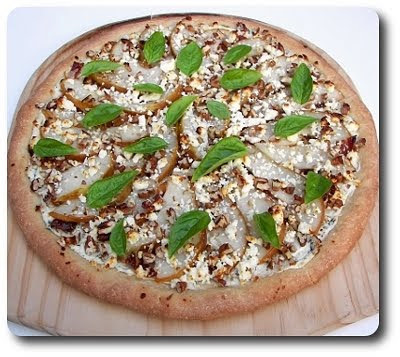 You may need to have an open mind when it comes to our Friday Night Pizza this week... see, this pizza involves candied bacon, a pear, cream cheese and feta cheese, plus a few other ingredients one might not ordinarily think (or want!) to put together. 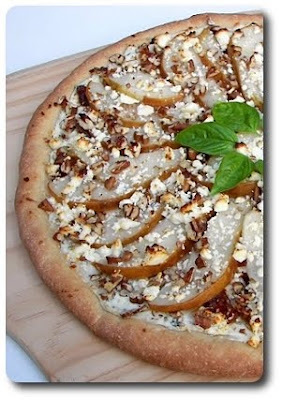 Care to push your palate and tantalize your taste buds with us while going over this Sweet Bacon and Pear Pizza? To candy bacon, all you need to do is smother the slices in brown sugar, then bake 'em off it in the oven until the bacon has turn crispy and, well, coated in a sweet shell. It will seem somewhat sticky right off the bat, but that quality lessens as it cools. If you remember, we used a similar method when we dived into the trendy bacon and chocolate combo by making those Crispy Chocolate Chip Bacon Cookies, though it didn't take nearly as long as we didn't opt for super thick bacon. For a little flare, before the brown sugar got cozy with the bacon, we did mix in a savory note in the form of chili powder. Since you won't be adding any toppings that necessarily need to "cook through", we stretched, then baked, our homemade dough for just a few minutes to set the crust and give it a bare golden hue. After a few minutes to cool, we smeared the top for the crust with softened cream cheese that was seasoned with fresh green onions, black pepper and a pinch of salt. 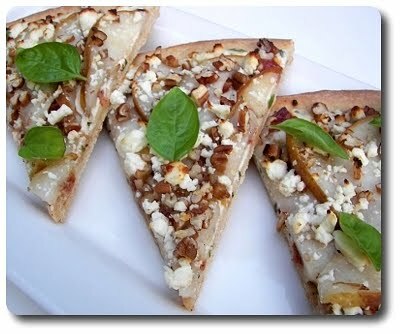 To continue the layering process, the salty, sweet bacon, first chopped into chunky bits, went on, followed by thin slices of pear (tossed with lemon juice to prevent them from oxidizing), chopped pecans and uneven crumbles from a block of feta cheese. With the crust halfway done already, the pizza doesn't take long to bake - start checking around the 6 to 8 minute mark. 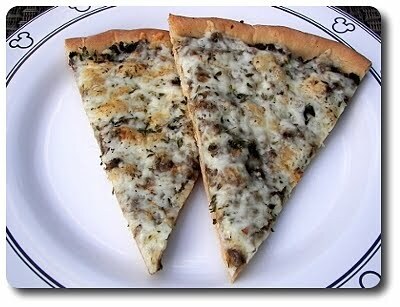 You are looking for the rim around the crust to be dark golden, with the nuts and cheese on top just starting to brown. Be sure to use raw pecans - since they are exposed on top of the pizza in a fiery hot oven, they will toast just fine on their own. Just before serving, we pinched a few leaves off from the last of our basil plants on the patio and littered the top with them. The verdict? I know it is probably cliché to say, but, hello "party in the mouth"! Salty, smoky, sweet, nutty and crunchy - it sounds as if it should be too convoluted, but all those ingredients managed to coexist in a way that we couldn't stop eating! Now, we made this for dinner, but I think this pizza would make a spectacular appetizer - I would do a couple things differently though. I would use the same dough, but shape it into a rectangle instead, allowing for small, tidy squares that are easy to cut and handle. With the portions being smaller, I'd also think about finding a jar of mild honey and either drizzling the sticky syrup over before slicing or setting a bowlful, with one of those fancy wooden honey dippers in it, for your guests to add a few dribbles on their square. It may be a bit cloying if you were eating a quarter of the pizza, but on a small piece, I bet it would make this even more swoon-worthy, possibly even clinching the top prize of the evening. Fall is supposed to be right around the corner, no? Apparently the weather in North Carolina has not gotten the message as the temps will continue to thrive in the 90s for at least the rest of the week. Don't get me wrong, I enjoy the warmth, but I would enjoy it more if it happened to be in the upper 70s or even low 80s! With a little help from the air conditioner and baking for the Weekly Wednesday Treat Day, at least I was able to make the inside of the house feel and smell like the cooler season has arrived by making these Giant Ginger Cookies. 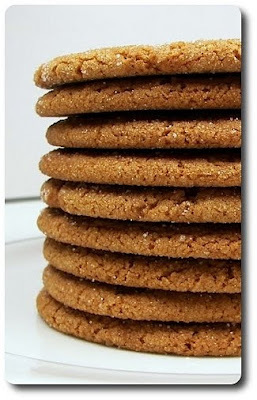 To get the dough going, brown sugar, granulated sugar and molasses blend into the softened butter (not meltingly soft - a cool room temperature is best for cookies), sweetening the dough with a touch of complexity and depth. After an egg joins the mix, flour, baking soda and salt create the dough, which were first whisked together, speckled with the aroma of fall in the form of snappy ground ginger and a hearty pinch of allspice. There was one more addition to give the cookies an intriguing bite - fresh ground black pepper. We felt a quarter teaspoon was just barely enough to notice, yet enough to take note, but ramp it up to a half teaspoon if you're feeling especially frisky. To make the dough easier to handle (it is a touch sticky right out of the bowl), it is flattened and stashed in the freezer while the oven comes up to temperature. These cookies are labeled giant for a reason - the whole batch of dough makes a mere 12, but you could make them smaller if you want. The easiest way to get the cookies as even as possible (without a scale!) is to quarter the dough, then cut each quarter into thirds before rolling them into balls. To give the cookies crunch and sparkle on the outside, the balls are rolled around in a pool of granulated sugar, then sprinkled with any of the leftovers once they make it on the baking sheet. 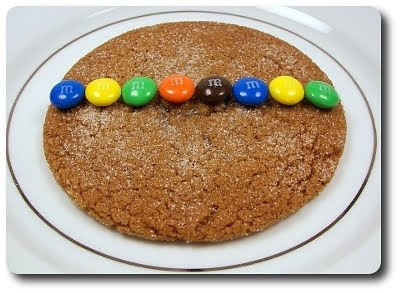 Because these cookies are so large (it took 8 M&Ms to cover edge to edge! ), you'll want to flatten each ball of dough before they bake to ensure they cook and spread well. Do be sure to give them plenty of room to grow - we spaced them 6 to a sheet and that was just enough that they did not touch. You can bake two sheets of dough at the same time if you like - use the upper and lower third racks in the oven, then rotate the sheets halfway through baking. As soon as they are done, let them cool slightly on the pans before moving them to wire racks - not only does this make them easier to transfer, but letting them rest on the hot pan extends their chewy nature. Large enough to split with a friend, measuring a good 5 inches across, these cookies rocked on the texture scale - crisp on the outer edges with a gratifying chew as you munch towards the center. The ginger-y wallop was pleasant, but now it has me wondering how these be with a scoop or two of chopped crystallized ginger (can't help it... I love that stuff!). Wrapped individually in cellophane packages, tied with a fancy bow, I bet these would also make fantastic bake sale cookies! Jeff's birthday is today and each year I make him some sort of cake, though last year that didn't happen as we went to Disney instead! I made that Mickey cake several years ago, a Devil's Food Cake with a ring of homemade Mint Chocolate Chip Ice Cream hidden inside and the outrageous Giant Chocolate Chip Cookie Cake and we certainly can't forget about those Caramel Apple Cupcakes. What did I make this year? Knowing his love for both chocolate and marshmallow and how well the previous Devil's food cake went over, I took it one step farther this time by making this snazzy Devil's Food White-Out Cake. Dorie once again came through and didn't let us down - while this cake does take some time to put together, it turned out to be alarmingly good and is really putting my will to resist it to the test. Cocoa powder, melted bittersweet chocolate and bits of milk chocolate inside this cake made it dark, dangerous and so chocolaty down to each last crumb. I didn't change much to the original recipe, though the one I did do was adding a scoop of instant espresso powder to press the limits of the chocolate-ness. Two cakes are baked, with little to no doming on either by the way, but you'll notice three layers in the finished piece. 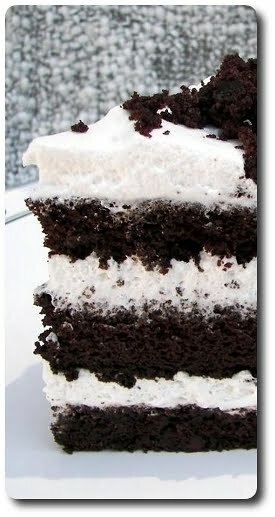 Each cake in halved, with the last layer torn apart to press into the frosting for a whimsical finish. Splitting the cakes is a snap as the cake is darn sturdy - if you don't think you can do this by eye, push a few toothpicks around the edges to help guide your knife. 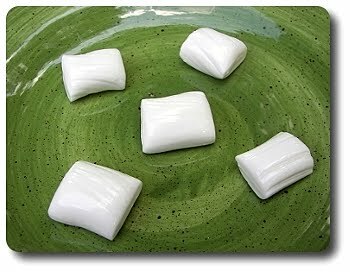 I had the rounds already baked, so all I needed to do this morning was whip together the homemade marshmallow frosting. 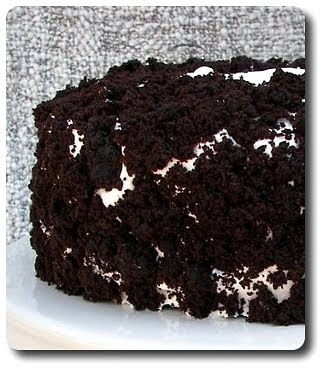 I think this cake could handle most types of frosting, but this fluffy, smooth marshmallow one is so light, billowy and not-too-sweet that it complimented the darkness of the chocolate, instead of fighting with it for control. It may seem a little off-putting dealing with boiling sugar syrup and egg whites, but this frosting is worth the effort and held up well to getting it on the cake and through slicing. I noticed that the cake was a little lighter in texture after I cut each in two for layering, but as it sat chilling until we were ready to dive it, it turned almost fudge-like, but in cake form. 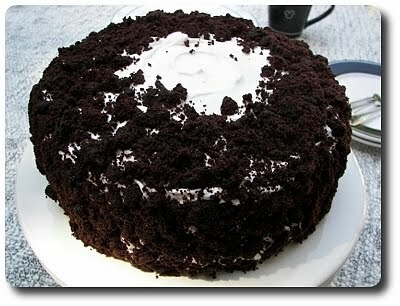 Dense and moist, like a ridiculous brownie, yet not as rich that you couldn't finish a chunky wedge. With its flashy, impressive appearance, I urge you to make this cake for your next celebration - not only will your guests thank you, but you'll be patting yourself on the back as you sink into your own personal chocolate coma of delight. Devilish, indeed. We missed last week's Pizza Night not because we didn't make one, but because we had a repeat on request - that Meaty Deep-Dish Pizza. 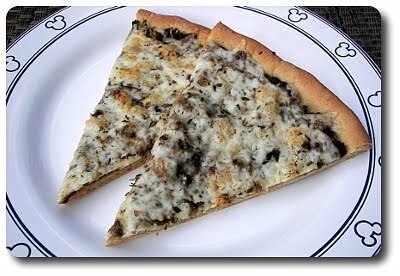 I think we could eat that crazy pizza every week... so good, if a little time consuming! 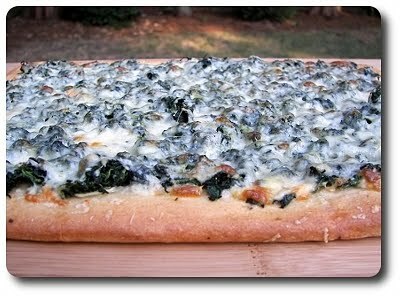 We're back to a new one tonight, making this Three-Cheese Spinach Pizza for dinner. 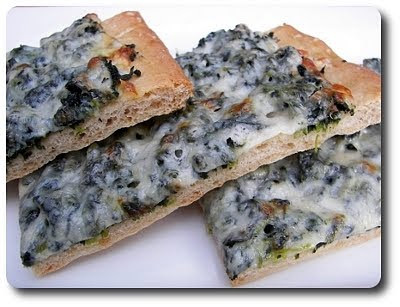 Jeff originally snubbed the idea of this pizza because it called for an ingredient he is fickle on... Gorgonzola cheese. I enjoy the funkiness, but Jeff would rather leave it than take it. There have been recipes that in the end he liked, but he wasn't willing to sacrifice a pizza with a scandalous cheese such as Gorgonzola... see? Fickle! With our usual homemade whole wheat pizza dough given the once over and pre-bake in the oven, we gave the pale crust a good brushing with shiny extra-virgin olive oil, then scattered over a couple pungent thinly sliced garlic cloves. Spinach was up next to be showered on top - we opted for frozen, thawed and squeezed dry, but if you have an abundance of fresh at your disposal, cook down about a half pound and squeeze out any excess liquid. 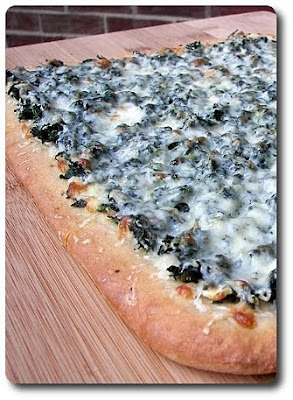 Be sure you season the spinach with salt and fresh ground black pepper - the cheeses certainly aid in a salty note, but the tiny crystals get into any crevices and ensure a well-seasoned topping! 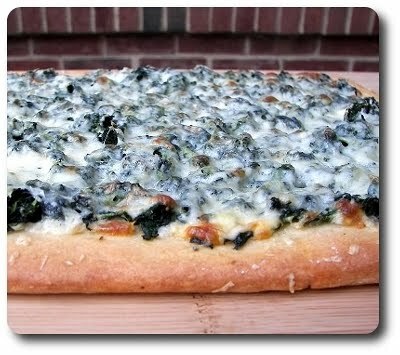 With our three cheeses of choice, Mozzarella, Parmesan and Gouda (standing in for Gorgonzola) scattered over the spinach, the pizza just needed a few more minutes on the hot stone to finish crisping the crust and melt the trio of cheeses. Smoked provolone or even Cheddar could stand in for the Gouda if you so choose, or be bold and go with the crumbled stinky cheese! The thinly sliced garlic underneath was a good touch - it work well to bolster the mild spinach with some pungency without becoming overwhelming. With another Wednesday upon us, you can be sure time was carved out today to prepare the Weekly Wednesday Treat Day goodie! With a harried weekend behind us, I wasn't able to menu plan for much this week, so to pick out what we were going to make, we took one of our most-used baking books and decided whatever it landed on (as long as it was new to us!) is what we would do. Jeff, with the help of Gus in his lap, cracked it open and guess what? 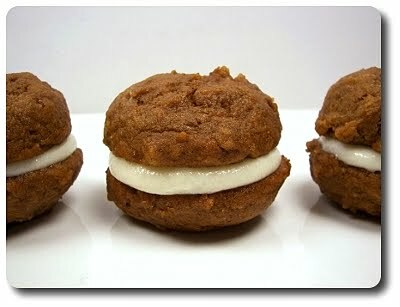 It landed on those Chocolate Whoopie Pies that we have made before. 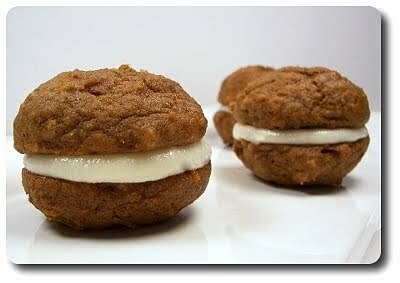 He tried again, which brought us to these Butterscotch Sundae Cookies, and again, we made those too. Third times the charm, right? Yes! This time, he managed to strike a new one - these Lemon Coolers. 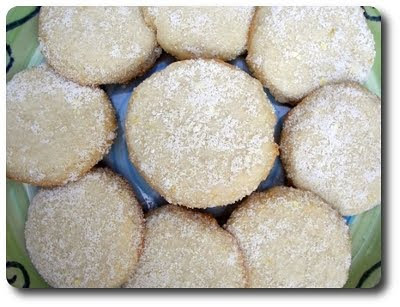 To incorporate the first layer of lemon into the cookies, we took note of a technique we first tried a few years ago by using your fingers to rub the intense zest into the sugar(s) before you begin mixing in the fat. Manhandling the zest this way bruises it, smashing the natural oils into the sugar making for quite the fragrant experience. You'll need a fair amount of zest to push the lemon flavor through - however, if you by chance have lemon oil at your disposal, drop the amount of zest down to a teaspoon and add a quarter teaspoon of the oil. Using butter in the cookies lends flavor and tenderness as one would expect, but to make these cookies tender and soft enough that they practically melt on the tongue, a half cup of softened cream cheese also jumps into the mix. With the dry ingredients stirred in to form a soft dough, it will need to rest in the fridge for a half hour before you begin the baking process. Dropped onto baking sheets using a tablespoon cookie scoop, the balls of chilled dough are flattened using the bottom of a glass, or measuring cup, to spread them into a rough round about a quarter inch thick. To prevent the cookies from attaching to the flattening utensil of choice, dip the bottom into confectioners' sugar between each press. Once they've been baked until the bottoms and edges are a bare golden, the hot cookies will be fairly delicate - let them cool right on the baking sheets for a few minutes to allow them to set and make them handle-able without falling apart. The tops of each cookie were supposed to be dipped into a lemon-laced sugary concoction, but in our case we need to spoon the sugar over the top and gently rub it in (see below). The mixture was made by blitzing superfine sugar with confectioners' sugar and two bright tablespoons of fresh lemon zest. Just as in the cookies, if you happen to have the concentrated pure lemon oil handy, you could take out the zest and use a quarter teaspoon oil instead. A good time to take care of this is either before you begin making the dough or while it is hanging out in the refrigerator, resting. When I was imagining this cookie, I thought the topping would be more like snow-like or powder-y and soft - you know, like powdered doughnuts or whatnot, but it was more like moist granulated sugar. 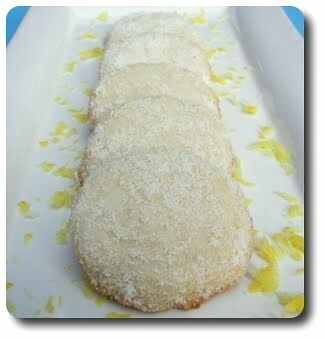 My guess is my lemon zest was extremely moist, which worked against the confectioners' sugar. Even if our topping wasn't exactly as intended, we both liked the sugar-y, tart crunchy crust it gave the cookies! I did, however, have a truckload of that sugar mixture leftover - at least three-fourths of it was still there when I was done with all of the cookies, making me believe it was suppose to end up powder-y. Refreshing, citrusy and a nice change from those heavier or chocolate laden treats. We've done a couple catch-up posts now, but they've all be in the savory department... and we are way overdue for the amount of sweets we've made lately. We even used mashed potatoes in a cupcake, though I'll get to that crazy treat next time as it definitely deserves a full post! We've been keen on that Peanut Butter Granola we first tossed together some three years ago, making it more times than I could count since then. I was browsing through Camilla's site and came across a healthy granola rendition that quickly captured my attention and it didn't take me long to put my spin on it, making this Spiced Nutty Granola. Rolled oats, two types of almonds (well, texturally - I used whole and sliced), cashews and unsweetened whole-grain puffed cereal were my choice add-ins, all held together using honey, pure maple syrup, molasses, olive oil, a combo of spices (I opted for a blend of pumpkin pie spice) and a touch of vanilla. A surprise ingredient you wouldn't necessarily think of adding to granola was also tossed in - egg whites! 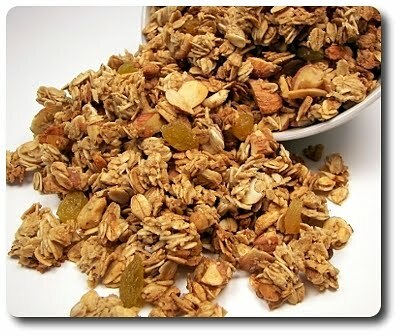 The whites add to the crispness of the granola without the need for too much oil; they also help some clumps to form - if you'd like to leave them out, top off the oil with three more tablespoons. We heeded Camilla's note and added the dried fruit - golden raisins in our case - until after the granola had baked and cooled, keeping them chewy and not hard little nuggets. Jeff and I both love taffy and have talked about making it for the longest time - we decided it was time and gave this Saltwater Taffy recipe we found a shot. This may not be a recipe for the timid in candy making as you are dealing with scorching hot sugar syrup, but it was a fun project that we'll likely tackle again as we loved this firm and very chewy candy. 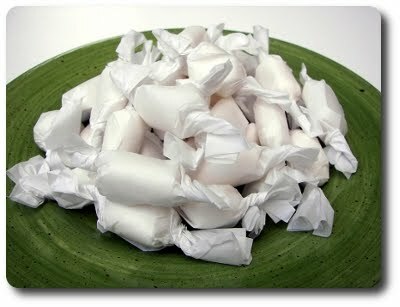 You will need a fairly unique ingredient - the recipe calls for edible glycerin, which helps the candy retain a softer, creamy consistency... I'm not sure if there is an acceptable substitute for this, but we found it at at a craft-type store (Michaels). We stuck with its natural color, but use paste coloring if you want to add rich colors - the candy is flavored via essential oil flavoring, which we actually already had from a cake store we frequented in Phoenix. We went with cherry and cinnamon, two of Jeff's favorites! I wrote the directions for one flavor, but you can do two (or more) just as easy - instead of stirring the flavoring in, pour the liquid candy as evenly as possible between the lined baking sheets and add a few drops of the oil. You'll work it in as you knead the warm confection. Speaking of, you might want a friend around for that part since it takes a fair amount of time to pull and stretch the taffy sufficiently - if nothing else, you will get in a good arm workout! We wrapped them in parchment paper, but wax would work well too. Our final sweet for this post are these wickedly easy Browned Butter Caramel Chews. We needed Corn Flakes for a snazzy dinner recipe that Jeff had been craving (that should make its way to the blog soon! ), but neither of us felt like eating the rest as cold cereal. All you need for these is butter (browned, obviously, but this is a cinch! ), brown and granulated sugar, an egg, vanilla, salt, shredded coconut and a few cups of the flaked cereal. It may not look like the flakes will hold together when you coat them with the sugar-y syrup, but the heat from the oven fuses them together, leaving you with chewy "cookies" that have a crispy shell. Frankly, I wasn't convinced with the coconut addition and thought about dropping it, but it was quite subtle in the end and added more in the way of texture, than flavor. This made more that we would eat in a few days, which landed the bulk of them in the freezer - they held up well, but did lose a little crispness as they thawed. Breaking them up into bite-sized chunks made for an outrageous topping for bowlful of vanilla ice cream, too! 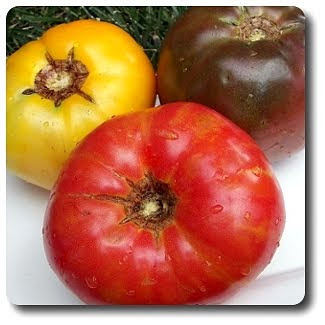 A couple weeks ago, the farmers' market was flooded with just-picked tomatoes - almost every vendor had their table littered with different beautiful varieties. Jeff and I found ourselves (along with several others!) especially captivated by one table that had a small, but colorful selection that was vanishing as fast as the farmer could get them refreshed. With no plan in mind for dinner that night, Jeff and I joined the small crowd and packed a few pounds in our sack and handed over what seemed not nearly enough bills to cover the cost. I even asked again if they were sure that's what the total was to make sure I heard it right the first time and the older woman nodded with a grin. After picking out a few other goodies, we jumped in the car and my mind immediately began spinning with ideas of what to do with these plump orbs... 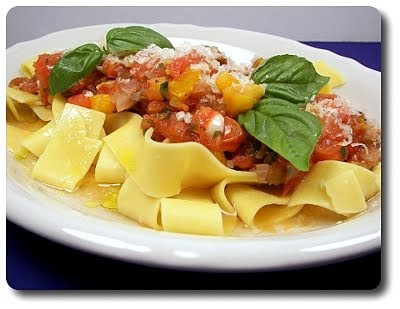 I glanced through a few options when we got home and decided on this veggie-friendly Heirloom Tomato and Herb Pappardelle dish. Extra-virgin olive oil gave us a starting point to prepare a brilliant barely-cooked sauce, to which we added a mess of thinly sliced shallots as soon as the oil was warm. Garlic is essential to this dish, of course, but don't be afraid to play with the amount - we added five fairly large cloves, thinly sliced, but two or three could be plenty if you like a more subdued presence. For the herb part of this dish, a plentiful amount of fresh oregano, rosemary and thyme are stirred in to the pot, along with salt, fresh ground black pepper and the lovely tomatoes, which we had seeded and diced into small cubes. When I said barely-cooked, I meant it - once the tomatoes go in, the sauce is only cooked for a couple minutes to just heat the tomatoes through. Another reason to use your best tomatoes here! 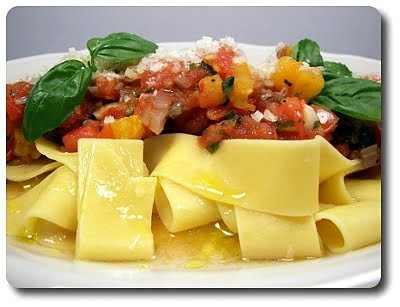 To go with this, we had a large pot of boiling, well-salted water on the stove all ready to to accept the package of wide-ribboned pappardelle pasta we dropped shortly after we started the sauce. With the pasta drained and divided between our plates, we scooped out the fresh sauce with an old metal ladle and inundated each portion. Two final additions topped our meal with a bang - a drizzle of extra-virgin olive oil and salty cheese shreds grated from a humble block of pecorino cheese. Jeff enjoys the even distribution of grated cheese bits vs large strips, but it you like bigger bites, shavings would definitely be appropriate. We found this plenty filling, but if you need more oomph to make it feel like dinner, a few grilled shrimp, lazily placed on top, would fit the bill. With all of those apples we picked piled up waiting to be eaten (which we've done a lot of) or used in a recipe, you can sure bet we decided to use them in the Wednesday Treat Day this week. 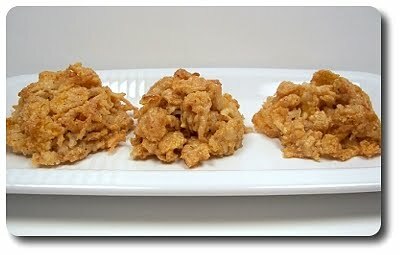 I've already made a batch of those Apple Pie Dog Biscuits for the pup, along with the maple syrup-spiked Chunky Spiced Applesauce to freeze for later consumption in the fall. We're here to talk about the work treat though, which was this intriguing Harvest Apple Challah. 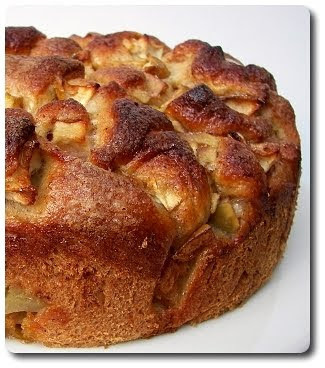 When PJ first talked about this recipe, I had excitedly saved the page in anticipation of trying my hand at it when we did our apple picking that year, but I also promptly forgot about it until recently (no big surprise there!). While it may not look like your traditional braided Challah bread and it is fairly messy to prepare, I definitely think you will be as pleased with the results as we were. and springs right back if you poke a finger into it. With the oil and honey in the dough, it will take its time to rise - set aside two hours or so, which is about how long it took for our ball to gain roughly double its original size. Remember how I said it gets messy? It's that time! Once risen, the puffy dough is gently stretched out into a rectangle, then topped with chunky apple pieces that were tossed with granulated sugar and plenty of our favorite Vietnamese cinnamon. 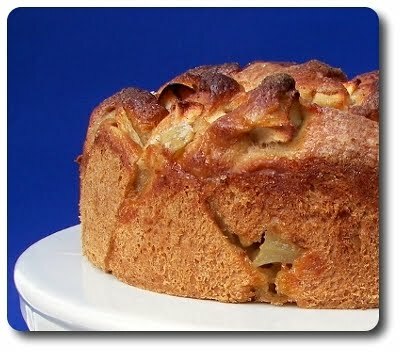 Only half of those apples are used first, with a portion of the dough folded over the top to cover them. On top of the apples you just covered, the rest of the sugared chunks go on, followed by another piece of dough to enclose them too - think like you are folding a letter when you do this. The stuffed dough is then split into 16 pieces, made by slicing the now-bulky rectangle into four pieces, then quartering each hunk of dough. Apples will fall out, juice will ooze over the work surface, you will start wondering what in the world you've gotten yourself into and it will look completely wrong, but forge ahead! The pieces of dough are tightly arranged into a baking pan (we used a springform pan as I haven't located our cake pans since moving - if you want to use a cake pan, make sure it has at least 2" high sides) - it will be fairly crowded, but that's intended... just try and keep everything in a single layer. Take any of the apples that had fallen out during the cutting or moving and nestle them in wherever you can - it won't, and should not, be perfect looking. Left to rise once more, the top is brushed with a light egg wash and sprinkled with sugar before sliding the pan in the oven. Use coarse sugar (or even turbinado) if you have it, but all I had on hand was granulated - we sprinkled over about a tablespoons-worth. 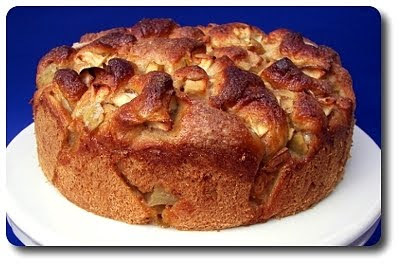 Bake this until the top is richly golden brown (some darker spots are okay) and you see no more "white" or very light spots of dough on top - if you have any concerns about doneness, a thermometer placed in the center (hopefully missing any apples!) should read at least 190 degrees. Serve it as is, sliced in hefty wedges, or if you want to doll the servings up, adorn each piece with a drizzle of honey from your best jar. 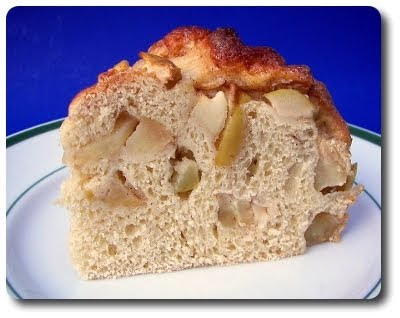 We found this to be somewhat of a cross between a fluffier yeast bread and an almost firm bread pudding - tender, light, just-sweet-enough and brimming with those cinnamon-dusted chunky apple cubes. One note - if you do use a springform pan, wrap the bottom with foil or place the pan on a baking sheet. Some of the juice from the sugared apples will drip out (it definitely did for us!) during the rising and baking process and doing this will prevent any leaks from reaching the oven floor. We've gone through quite a bit of quinoa lately, but we've been eating it in the morning - cooked with a bit of milk, sweetened with honey (maple syrup is wonderful too) and cinnamon, then topped with a handful of toasted sliced almonds. I usually get it taken care of the night before, then zap it in the microwave for a speedy, filling bowl o' breakfast. 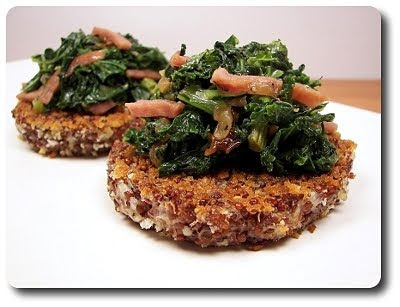 Quinoa is easy to take sweet, but in the bat of an eye, you can go savory too, like in these Quinoa Cakes with Ham, Onion and Chard we made. You don't have to fuss much with ratios in cooking the quinoa here - just slosh it in a pot of boiling (well salted) water, then let it cook until it has become tender. You can taste a few to check, but quinoa also has a built-in visual doneness meter - the seeds are ready when you can see that the little curlique in each seed has exploded out. We used the spunky red quinoa, but the pale blonde kind is just as good. With the water drained away and the quinoa given a chance to cool, we tossed them with fresh grated Parmesan cheese, a couple eggs and crisp panko breadcrumbs to bind the seeds together. Formed into small cakes (a larger ice cream disher works wonders), we let the rounds hang out in the refrigerator for about 30 minutes - the recipe didn't originally call for this, but we've found through experience that items like this hold together when given a chance to mingle in the chilly refrigerator air. With those taking a break, we had plenty of time to get the onion-y topping together. You'll need about two medium onions, thinly sliced, to have enough to go around. Slowly cooked with fresh thyme in fruity extra-virgin olive oil, don't rush this process - keep them over medium to medium-low heat, stirring occasionally, until their natural sugars have been drawn to the surface, caramelizing them into a rich golden color. 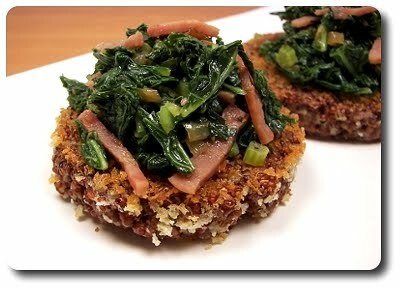 Thinly sliced ham joins the tender onions, along with sturdy Swiss chard, anchoring the topping down with its earthy roots. Once the chard has wilted, the topping is moved to a plate and covered to keep warm, while we use the same skillet to cook the tidy cakes. Before dropping them in, we gave each a dip in a bit more of those coarse breadcrumbs to coat, then browned them in two batches, allowing them to cook evenly with plenty of room between each cake. 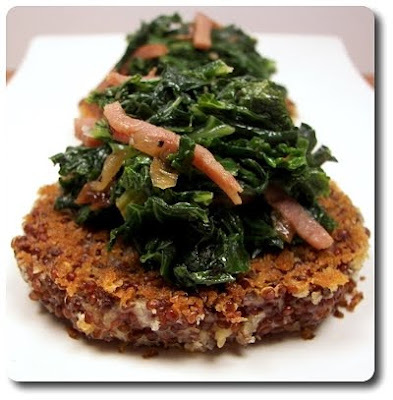 Quiona can sometimes be on the flat, dull side by itself, but between the salty cheese inside the cake and the sweet green topping, each healthy bite kept our taste buds on call, waiting for the next dynamite mouthful. One final note on quinoa - if you've never used it before, be sure to give the tiny dots a good rinse before using. Even if your quinoa says it has been pre-rinsed, I suggest this - the washing gets rid of its bitter saponin coating, which could easily ruin a tasty dish! 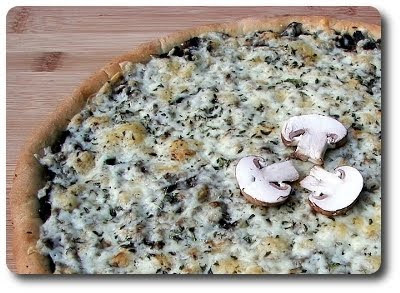 Mushroom Fontina Pizza... yeah, I just said mushrooms, on pizza. Dangerous, I know, messing with Jeff's favorite night of the week, pizza night, with the dreaded 'shrooms. However, he gave me the go ahead and was even willing to pick out what kind we were going to use! See, I was not all that serious when I mentioned it, thinking he would give me "the look" and tell me to pick again... imagine my surprise when he agreed! The times they are a-changin'. He was a little overwhelmed when I led him to the mushroom section at the market, a section he wouldn't give a second look to, but he made a good choice opting for a pound of cream-colored crimini buttons (baby portabella's). I think one of the reasons he decided this recipe would be good to try was the fact the mushrooms were not going to be sliced or kept whole - instead, after stemming each, they went into a food processor and were coarsely ground. Not smooth, but pretty close - more of a chunky paste. The paste is fairly wet as the 'shrooms contain a fair amount of moisture, which we need to take care of to prevent a soggy pizza. Added to a pan of already softened onions and garlic, the mushrooms are left to cook until most of the excess liquid has evaporated. Take your time and have patience here - stir them fairly often for the first few minutes, but after that, try to leave them alone for 3 or 4 minutes at a time. You'll notice that the paste will begin to brown, concentrating their natural woodsy flavor as the volume begins to shrink down. As soon as the mushrooms were done, the heat was turned off and the dark mix was freshened up with a hit of chopped parsley. We did do our normal routine of stretching out the dough and giving it a quick pre-bake, which I took care of before I started on the topping to get it out of the way. Assembly was a snap - the top of the crust was covered with the condensed criminis, followed by tiny fresh thyme leaves and an almost overflowing amount of nutty, mild and creamy Fontina cheese. Since the dough had spent time in the oven already, it didn't take much time to turn the cheese bubbly and finish the crust with a golden brown (crunchy!) hue. If you opt to use a raw dough instead, you'll need to bump up the bake time needed by 5 to 7 minutes. I think I could see the look of regret in Jeff's eyes when the pizza came off the stone, but he was a trooper and had a smile (albeit somewhat fake...) on his face as I sliced off wedges. He closed his eyes and gradually brought up a slice and took the smallest bite I've ever seen him take - his tense shoulders relaxed and I could have sworn he mumbled "This is actually not bad". I had to ask if that's what he said... he replied with "Ugh, yeah and I guess I won't be asking for a peanut butter sandwich after all!". 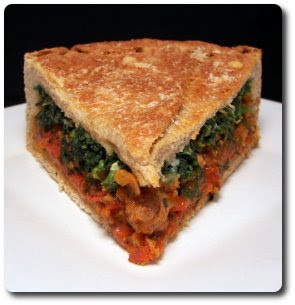 Of course you can use any dough that you fancy, but I do think this notable, earthy topping translated well with the weightier whole-wheat crust, rather than a fluffier version. For a touch of elegance and decadence, drizzle the top, as soon as it comes out from the oven, with a little truffle oil for a special treat. One of the people Jeff shares the Weekly Wednesday Treat Day goodies with happens to have gluten issues, so she hasn't been able to indulge in most of the treats we've done. She was able to snack on those Caramel Corn Clusters, but not much else. Jeff reminded me of that and this week I thought it would be good to do a treat she could eat without worry, which ended up being these salty/sweet Flourless Peanut-Chocolate Cookies. I did, however, just find out tonight that she has apparently been back to eating foods with gluten and is doing well! Either way, you won't miss the gluten in these cookies! 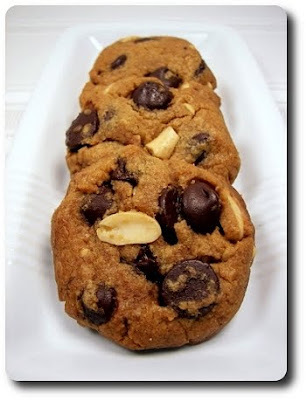 One of the best traits about this cookie is that you don't need anything fancy to prepare the dough - a bowl and a sturdy wooden spoon does the trick. The next best part? It uses pantry staples (well, we keep them handy) - creamy peanut butter, sugar, a couple eggs, baking soda, salt, chocolate and peanuts. Yes, you read that right - there is no added butter or oil! I did toss in a splash of vanilla as it tends to round out the flavor in cookies and suggest you do the same, but they wouldn't be ruined if you didn't have it. You can use completely granulated sugar if you like, but I swapped out a portion for brown sugar to add a bit of complexity from the dark molasses. The dough is fairly stiff, especially once the ample amount of chocolate and peanuts go in - since there is no flour involved, you don't have to worry about over-mixing to work them all in. 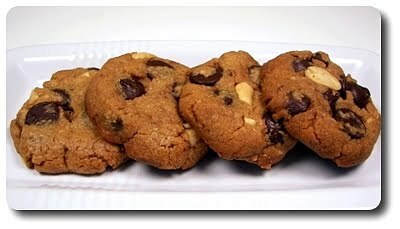 Being so stiff, I baked a couple test cookies to see how they do before I started loading up the sheets. I found the cookies didn't spread much at all - we flattened them for a more traditional cookie round, but you could leave the dough as a ball if a puffier mound is desired. Being slightly crumbly in texture, the cookies have an interesting tenderness to them that oozes into more of an addictive chew the more you eat. The peanut flavor is abundant, coming from not only all of the peanut butter in the dough, but the crunchy addition of the salted nuts jammed in. I loved the bite from the bittersweet chocolate nuggets, but semi-sweet may be more appropriate if you'd be serving these to kids.